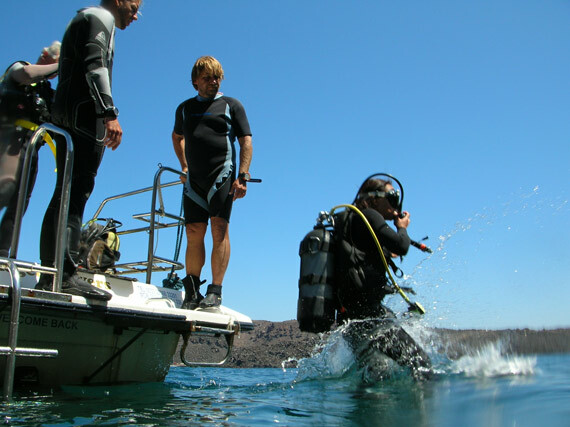 My second dive excursion on the beautiful Greek island of Santorini was with Aegean Divers in Pyrgos. The centre is located on the main north-south road, which runs to Oia in the far north, through the capital of Fira, through Pyrgos and down to Kamari/Perissa and the southernmost tip of the caldera. This is both a good and strange location at the same time: Aegean’s premises look outwardly like a truck-stop café, perched on a dusty verge with constant traffic thundering past. 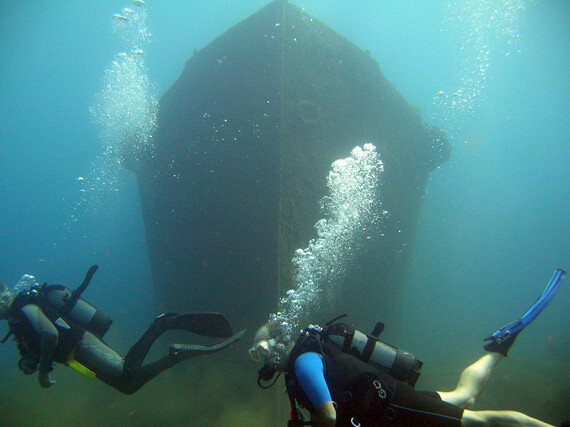 Most dive centres are found on beaches or in resorts, so there can’t be much ‘accidental tourist’ traffic dropping by of an evening on the off chance. 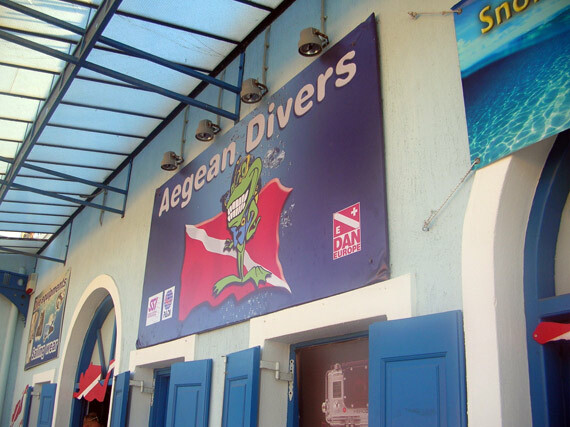 Conversely, by being at the crossroads of almost every road on Santorini – of which there admittedly aren’t many – Aegean is in a prime spot to take divers to almost every site logged around the island. 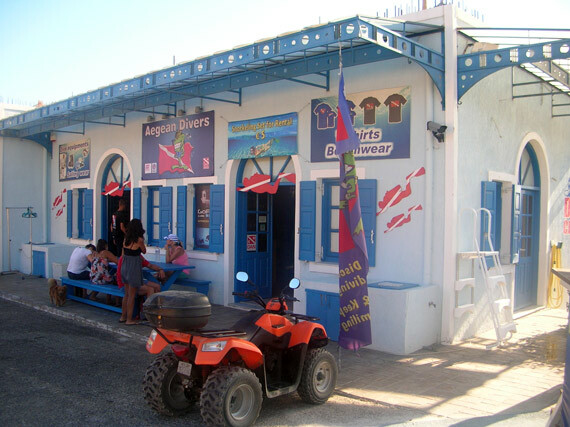 Kostas, dive centre owner, claims to have compiled a definitive list (and map) himself since his arrival from the mainland several years previously. Just as my first dives with Navys Waterworld were on the seaward side of the volcano, Aegean’s team are preparing us to dive inside the volcano’s crater itself. Today’s group is just as large as before with a mixture of trainees, DSD students and several qualified divers. In Wacky Races fashion, we head down an uncomfortably steep dirt track in a convoy of vans, 4x4s, quad bikes and mopeds to a small bay nestling below the craggy cliffs of the caldera. 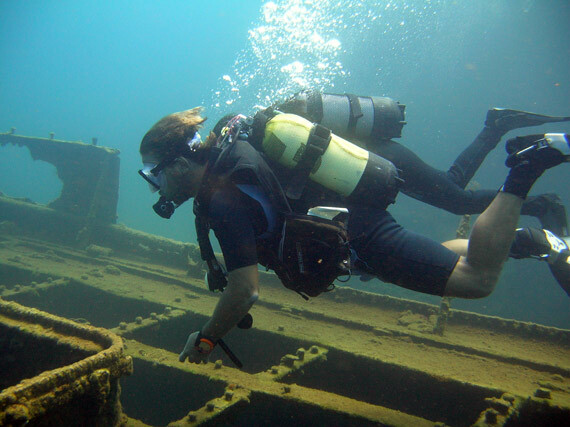 Tied to a jetty on the black sand and pumice beach is Aegean’s dive transport, a midsized hardboat with inboard engine. 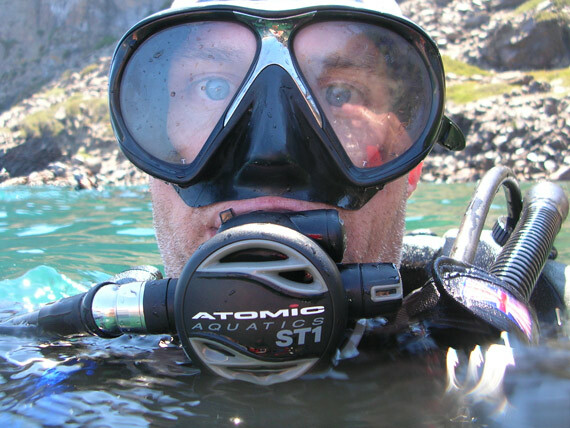 The team of Dive Masters and Instructors pitch in and load up as the guests sit around – my instinct as a BSAC diver to pitch in and help being greeted with a friendly scolding. Finally Kostas revs the engine and ropes off. 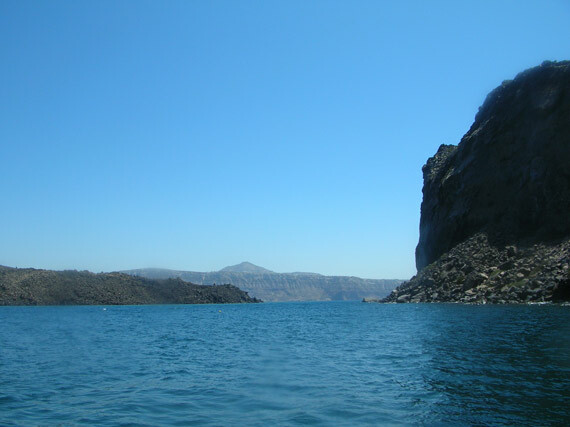 We’re headed into the centre of the caldera and the youngest part of the Santorini island: the active crater. Nea Kameni, or Volcano Island as it is known is the most active part of the island, from where puffs of smoke still bellow occasionally. Even an interested but amateur geologist like myself can tell that the rocks here are much younger: black and charred, more like lumps of coal than stone. 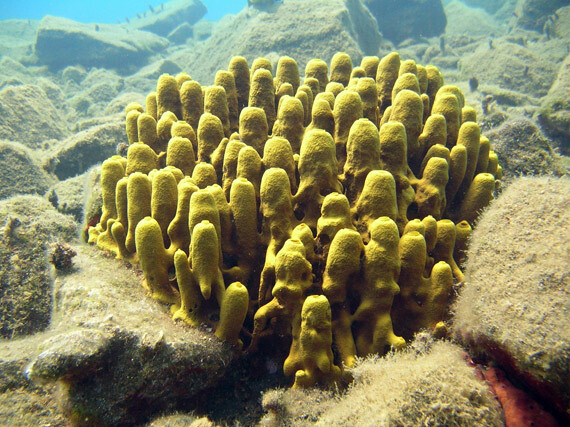 Sulphur bubbles up beneath the cliffs and pools into green-tinged hot springs that are a draw to boatloads of tourists on day trips from Santorini. 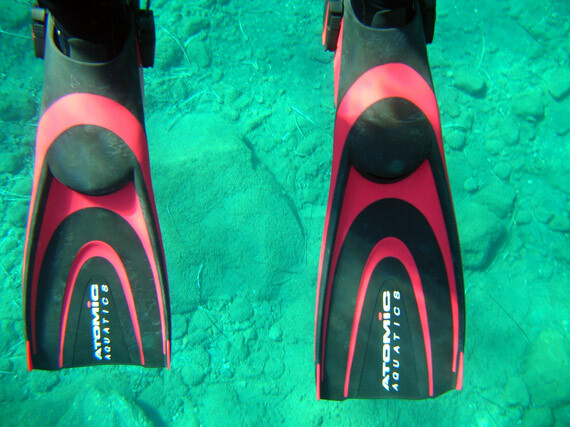 Kostas and Dive Master Demi (half-greek, half-Aussie) are running the excursion and we gear up and giant stride into the cooling waters. 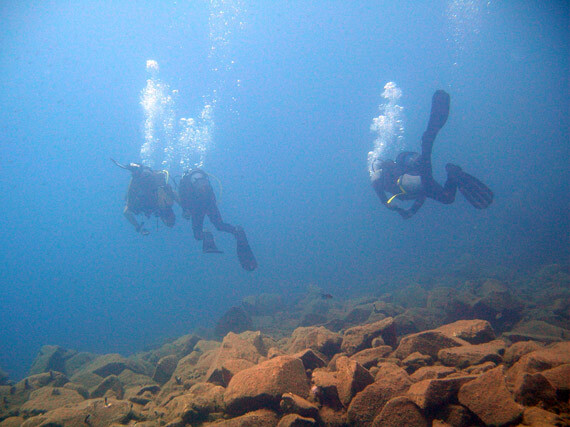 First dive is a descent to about 20 metres and swim alongside a huge wall – this is the edge of the volcano’s crater, which drops down in abyssal fashion to 300-400metres or more. 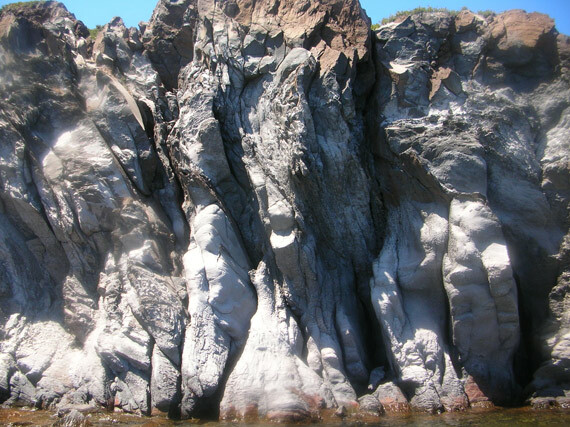 The visibility is at least 20 metres and the rock formations are stark against the bright sunlight streaming through. 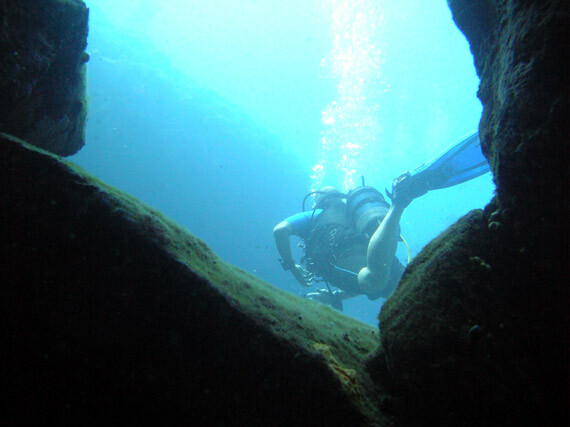 Our turnaround point is a fissure in the wall with a clamber-in swim-through clamber-out. 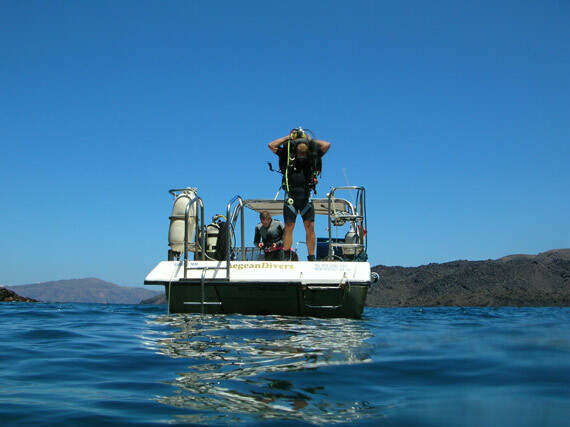 After a surface interval we move the boat into a sheltered channel next to Nea Kameni. 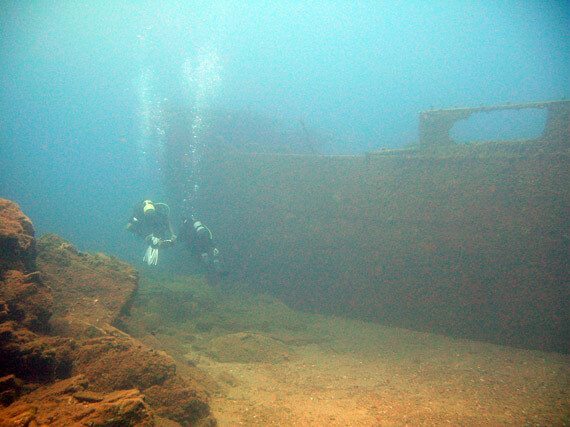 Next target is the wreck of a merchant vessel that sank in the mid-1920s in mysterious circumstances, Kostas explains. 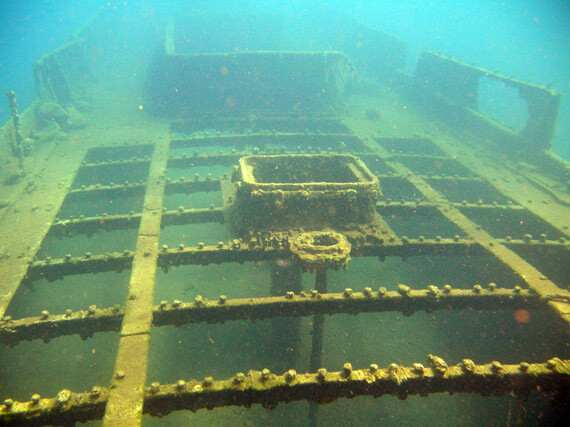 No-one seems to know the ship’s name or why she foundered, and even though her stern is completely destroyed, this appears to have been done by salvors looking for the bronze prop and engine. 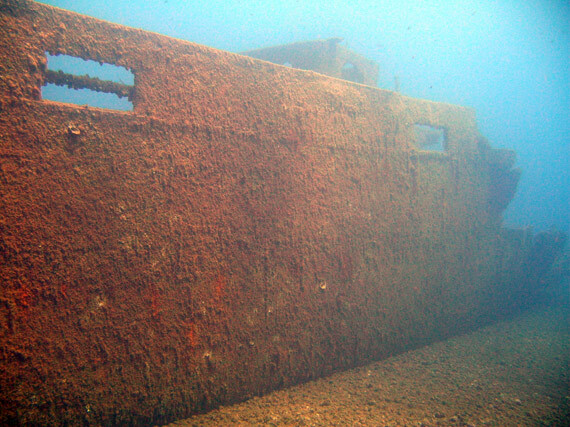 As we swim towards it, the rest of the ship is clearly visible from at least 20 metres away and appears in good enough condition to raise and refloat. There’s negligible growth on her hull plates and from my vantage point on the seabed, appears to be bearing down on me like an icebreaker. Scattered amphorae all around are a reminder that we’re diving in Greece. 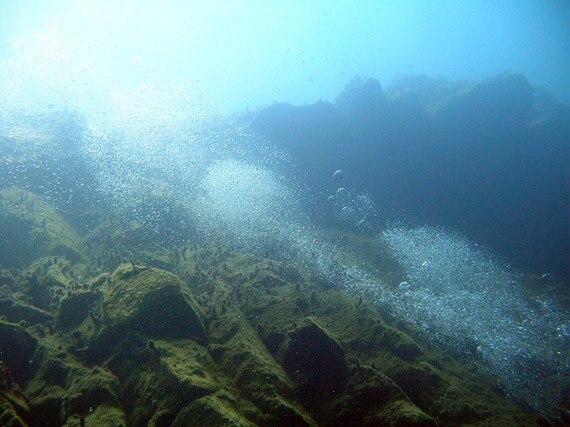 Always pleasant to have a seabed below, and here it’s a mixture of fine white sand and layered rock plateaus. 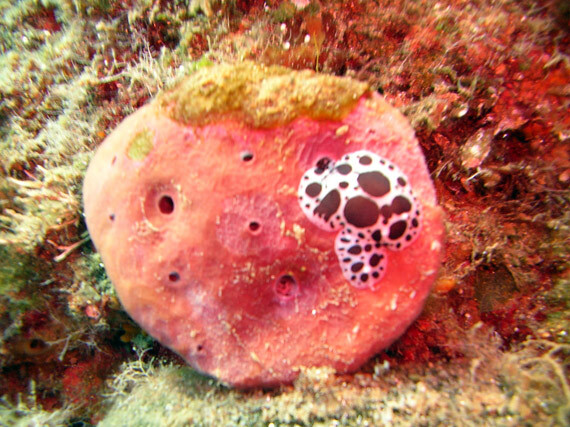 Small ‘cow’ nudibranchs adorn the rocks, so-called because of their Friesian black and white appearance. 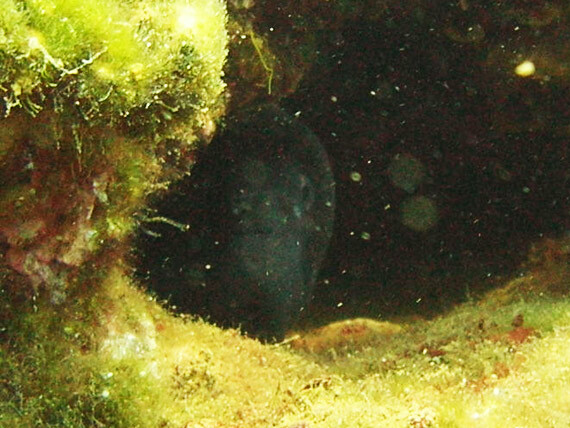 A shy moray eel also tucks himself into an alcove, and we spot a second in the wreckage of the ship. The group swims through the holds, poking our heads through where the hatches are long gone, sunlight streaming in to reveal a cargo of sand. 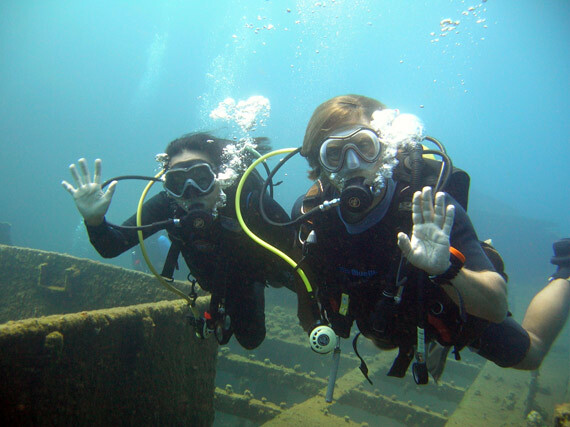 It’s very pleasant, unhurried fun, just as holiday diving should be. The return to the dive boat takes us on a gradual ascent, and as I finish my safety stop, realise this is my last dive in Santorini on this trip. It has been very enjoyable, but with so much more to explore, this island really should be on many more British divers’ lists. 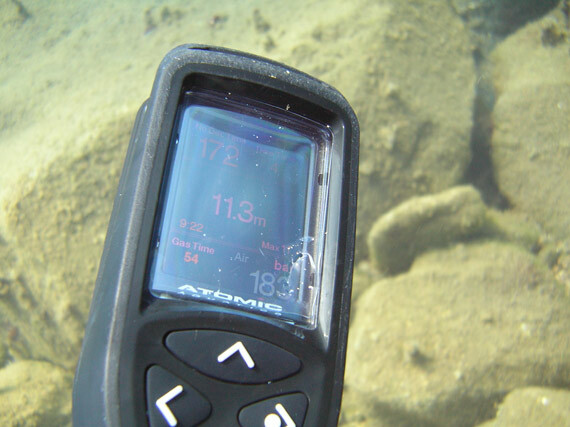 To find out more about Aegean Divers, check out the website www.aegeandivers.com.